The advantages of farmers markets are many. The quality is typically top-flight. Items are sourced from local and regional producers — many of whom use sustainable or organic methods — and most vegetables and fruits are at the height of freshness. You get to know the folks responsible for the offerings. And let’s face it, most farmers markets make shopping a lot more fun than going to the supermarket. There is one factor that stands out as an inhibition for some people, though — the perception that shopping at farmers markets is too expensive. But that ain’t necessarily so. 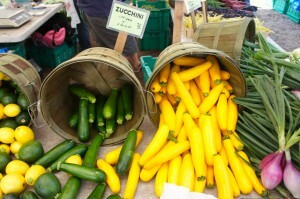 New York Times food journalist Mark Bittman noted this in a piece published Aug. 5 to mark National Farmers Market Week. This is something that I already knew, as a budget-conscious shopper who visits farmers markets once or more each week. ● Don’t rush — tour the market first. Take a stroll around and see the prices different stands are charging for the items on your shopping list. All of the vendors have high-quality goods, but if you’re shopping for price, it’s frustrating to discover that you were hasty and missed a bargain. ● Some stands stand out on pricing. Savvy farmers market shoppers will quickly figure out which stands go out of their way to be consumer-friendly. For example, Illinois’ Smits Farms sells big bunches of greens, such as kale, and herbs for as little as $1 apiece. ● Look for bulk discounts. Many farmers market stands provide a price break if you buy multiple items. For example, Green Acres Farm of Indiana sells summer squash (zucchini and yellow) for $1 apiece, but three for $2 (bringing the price down to 67 cents each). Nichols Farm of Illinois sells beautiful green bell peppers for $1 apiece, but four for $3 makes them 75 cents each. Many fruit stands will give a discount if you buy more than one container, and quite a few allow you to mix and match to get the bulk price. ● Buy seasonally. When an item is at the peak of its season, there is likely to be more of it — especially if it is a prolific growing year for that crop — and some stands may lower their prices to make sure as much as possible gets sold. ● Buy the large “economy size.” If the per-item price is fixed, you can stretch your dollars by selecting one of the larger of that variety. For example, Nichols on Saturday sold melons for $3 each. I picked out one that could meet a family’s fruit needs for maybe a week: about as big as a cannonball and almost as heavy. 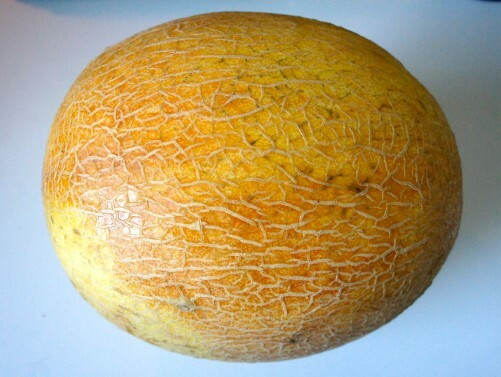 Weighing in at nearly six pounds, this melon averaged to about 50 cents a pound. ● Become a regular. O.K., I hope I’m not giving away any trade secret here, but if you get to know producers and buy regularly from their stands, you are more likely to get a personal discount. That is also true if you introduce your friends and family to become customers. It works in bars and restaurants, so why not at farmers markets? This entry was posted in Farmers markets, Good Food movement, Regional food systems, Sustainable food retailing, Sustainable food systems. Bookmark the permalink. One big positive of farmers markets is that (at least here) there’s no sales tax. That can save 5-6% on your purchases based on location. It’s 6% here. Another point this year is that the California drought has pushed up grocery store prices. We do all of our fruit for $2.50/lb, even our donut peaches, which are sold for higher prices in stores. Customers get giddy when they realize the price. No one is complaining about prices this year because they’ve been in the stores. We also haven’t raised our prices in several years. Many farmers also will sell seconds for half price or less. We sell buckets of tomatoes for $12 — comes out to about $1/lb. People love to use them for canning, sauces and freezing. There are also bargains to be had by using ALL of the vegetable, which is often not an option for those purchased at a grocery store. When purchased directly from a farmer, the vegetables are really fresh – which sometimes means that “bonus” plant parts can be eaten. Beet stems/greens, radish greens, and broccoli stems are just a few examples. Great points, Vicki and Erin… thanks for sharing! ASK the vendor for a deal. Often they are ‘locked into’ a market average price and set out by market management, but if you are a regular at a vendor booth and ask them for their ‘best price’, they may just be able to give you a deal. Be sure NOT to blab it at the market that exact day,, be grateful, express your thankfulness to your vendor,, return there. In addition to the free monthly food newsletter I produce, I also have a cottage food jam business, so I enhance my market experience two special ways. First, when a farmers product is in an issue of my newsletter, I point it out and give them some copies so they can offer recipes to their customers. Second, when I buy something from a farmer that I turn into a preserved product, I make sure to give the farmer a jar of whatever I made with their fruit! Yes, I get lovely bonus and quantity discounts as a result, but the farmers make up in volume from the customers I send their way! I go one hour before the market closes when the venders are ready to make great deals. I stick to one or two venders so that they get to know me and we form a relationship. They love it when I ask questions about the produce, where is comes from and how they are successful. The more I buy, the bigger the discount. Sometimes I offer to buy up all the leftovers and that makes them very happy! My favorite vender will even load up the boxes of produce in my car for me. They know that I can a lot so I’ll bring a can or two for them as a thank you for giving me a deal. Forming a relationship with the venders is key to saving some dollars and getting insider information (I’m very curious about the farmers market life. Haha). Great article. Wanted to share information that may be of interest regarding pricing. 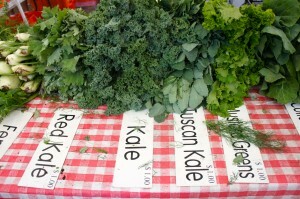 A group of University of Illinois Extension local food systems and small farms educators have collaborated with the University of Kentucky’s Center for Crop Diversification to create an Illinois farmers market price report. The University of Kentucky center has compiled price reports for farmers markets and produce auctions around Kentucky since 2005. 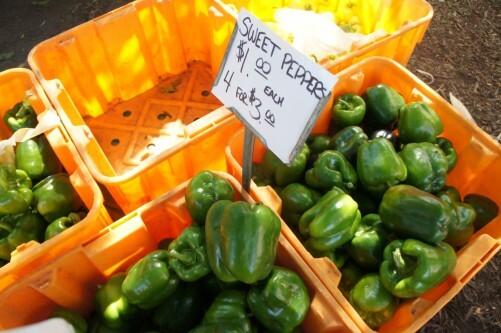 In 2013, faculty and Extension personnel at the University of Tennessee started reporting prices from farmers markets, with assistance from the Kentucky center. “This year, Illinois became a partner with the center to create our own statewide price report,” said Deborah Cavanaugh-Grant, a U of I Extension educator. Farmers’ market prices are collected weekly and reports are published on the website early the following week. Using these reports, producers can monitor fluctuations in prices and determine which crops are available at different locations or regions within the state. “These reports are also very useful for new producers who are starting to market their products through various channels,” Cavanaugh-Grant said. During its first year, U of I Extension will collect data at 11 markets throughout Illinois, from Machesney Park to Harrisburg, and from Quincy to Urbana. Each week, Extension educators, program assistants, and/or Master Gardener volunteers will collect information about the vegetable and fruit crops being sold. An average price for each commodity is reported for each of the markets based on information from each of the vendors at each market. Price information from each of the markets is then aggregated into a weekly report. There will also be a one-time report for meat and egg sales. To access farmers’ market price reports for all three states, go to http://www.uky.edu/Ag/CCD/price.html, or contact Cavanaugh-Grant, cvnghgrn@illinois.edu, or Bronwyn Aly, baly@illinois.edu.